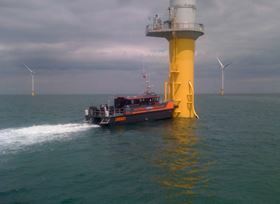 CTruk's Cardinal P composite wind farm support vessel. CTruk produces a range of catamaran work boats and wind farm support vessels at its shipyard in Brightlingsea, Essex, UK. The inking of this latest order follows the recent naming of Pontrilas, Hereford, UK-based OTS' fifth CTruk multi-purpose workboat, the Commodore P.
From the start OTS’ operations director Nick Bright, has worked closely with CTruk on enhancing the CTruk 20T design to fit OTS' specific requirements. Originally a staunch aluminium fan, Bright recalls his first experience of the composite 20T as ‘a real light bulb moment.’ Cruising at 20 knots on the CWind Alliance, he ran a real-time fuel consumption comparison with his son, who was skippering a 15 m aluminium vessel at the time. Their subsequent discovery that the 3.5 m larger 20T was nearly 45% more efficient, at the same speed and with the same payload, was a key point in Bright’s conversion to composite craft. All five existing OTS vessels are currently at work on CWind contracts around the UK. Opportunities for composites in wind farm service vessels (Part 1).